Google UK in partnership with Retail Reserarch companies, trade organisations and media titles, has created Retail Industry Google Gadgets. 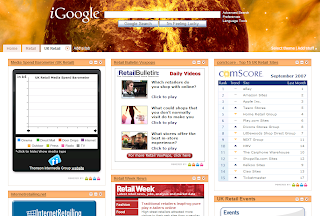 Among others, the partners include, Retail Bulletin, Retail Week, Comscore, Hitwise and the IAB. The Gadgets are free to use on your iGoogle Homepage and adds on as a tab to iGoogle. The iGoogle Page looks as shown below once you have added the Gadgets. Google’s partnership with prominent research companies, trade organisations and media titles brings fresh insights to help the Retail marketing community connect with British shoppers. Google UK Retail Industry gadgets are mini-applications offering a wealth of free information to Retail professionals. Together with our partners, we propose a range of news resources, industry data indicators and inspiring rich media content. Google UK Retail Industry gadgets help you connect with your consumers and provide inspiring new ideas!